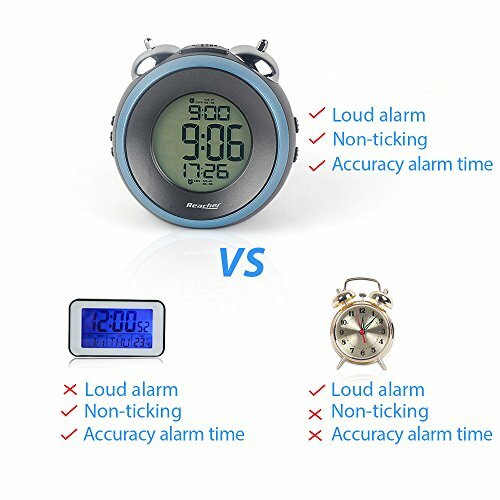 The twin bell makes it a very loud alarm clock to wake up heavy sleepers, and compared to other bell clock with dial, the digital clock enables to set the accurate alarm time you want. It is a perfect fit for kids, students and adults alike. 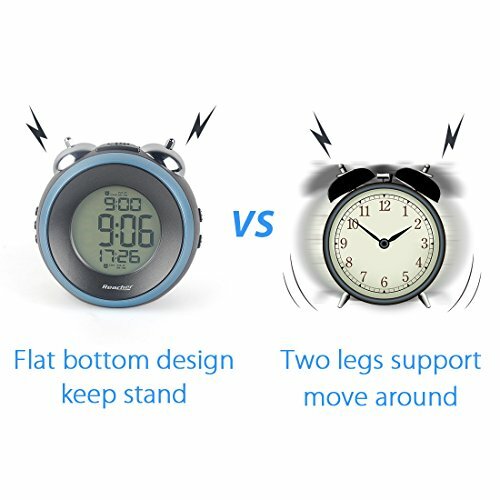 The non-ticking bedside alarm clock is capable of setting 2 separate alarms for different wake-up or remind times, with a snooze functionality that allows the alarms to sound every 5 minutes until it is turned off. The vintage bell clock has 3 optional wake-up dates: Weekdays (Monday through to Friday); Weekend (Saturday and Sunday); and Every day (Monday through to Sunday). Choose the most appropriate one for your needs!! 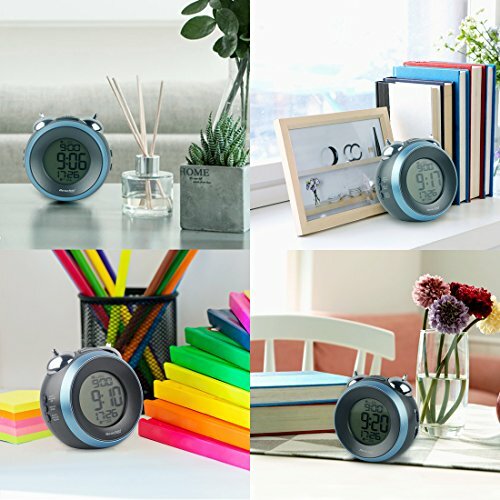 Slightly touch the top button, the electric alarm clock will light up its display to make it easy to read in the dark. And, to save energy, this backlight will automatically turn off after 8 seconds. 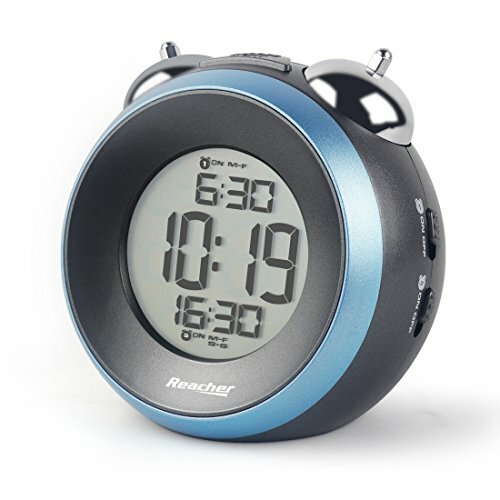 The Reacher digital alarm clock comes with an impressive 45-day money-back guarantee as well as an 18-month warranty. Add one to your shopping basket today and get ready to enjoy a worry-free after-sales experience. 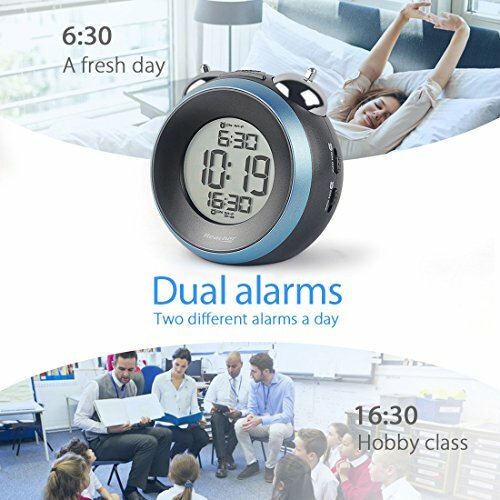 While a very unique collocation of grey and blue makes this vintage twin bell alarm clock look retro, at the same time it is full of unmatched youthful energy. The Retro style takes you back to the 1980s, with cute nice-looking touches to your inner child. It is perfect for men/ women/ adults/ kids/ school-going students/ children... virtually everybody! 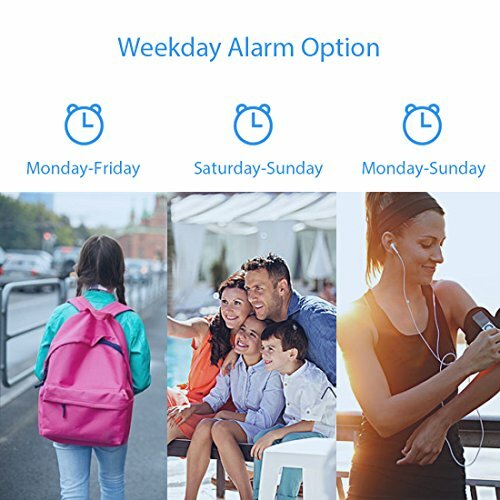 There are 3 optional alarm settings to pick from here: weekdays, weekends and every day. This is a perfect selection for students who want to wake up on weekdays and sleep during the weekends. Hold the "alarm 1 set (hold) /UP" button for about two seconds, "M-F S-S" flash. Press again to select them. Alarm 1 and Alarm 2 can be set the same way. - S-S = Saturday through to Sunday. 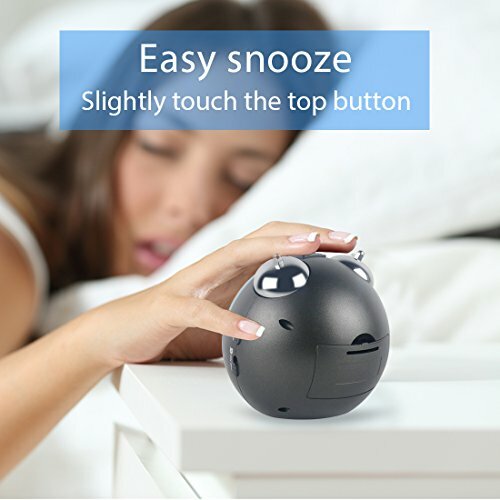 Gently touch the top "SNOOZE/ LIGHT" button. 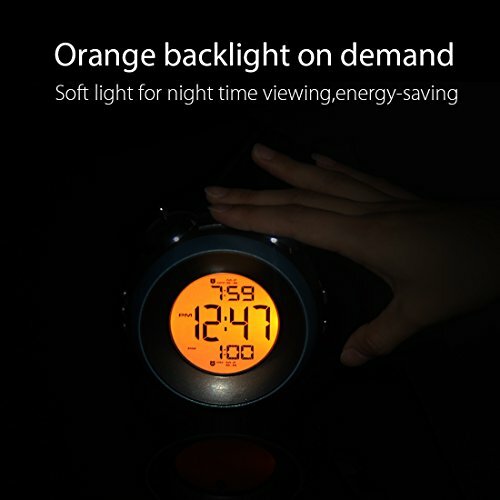 The orange backlight will help you to easily check time softly and clearly at night. The backlight turns off automatically after 8 seconds to save energy. Double touch the top "SNOOZE/ LIGHT" button. The calendar will show up in the display but then it will go back to time display after 8 seconds. When the alarm is going off, just touch the "SNOOZE/ LIGHT" button simply to get that extra 5 minutes of sleep. Slide the left "ON/ OFF" button to turn on or switch off the alarm. The LED display will indicate either ON or OFF. 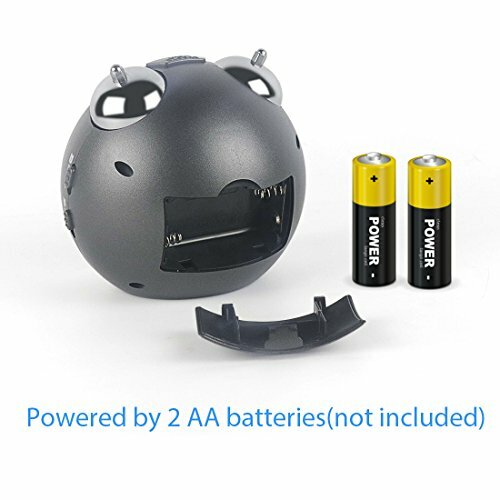 The bell clock is powered by two AA batteries (not included thus purchased separately).